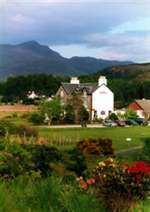 The Lochshiel House Hotel is a 2 star family run hotel in the West Highlands of Scotland. Approximately 1 hour from Fort William situated in Acharacle about 100 metres from the southern tip of Loch Shiel & at the Eastern entrance of the beautiful Ardnamurchan peninsula the most Westerly point of the British Mainland. Lochshiel House was built in the late 19th century as a hunting lodge and adapted to a local bar and hotel in the 70’s.